"Investing in Income Properties is a cogent and well organized presentation of the principles of real estate analysis, financing, and investment. With his ′Big Six Formula,′ Ken Rosen shares his knowledge and experiences on how to analyze and take advantage of commercial real estate investment opportunities. 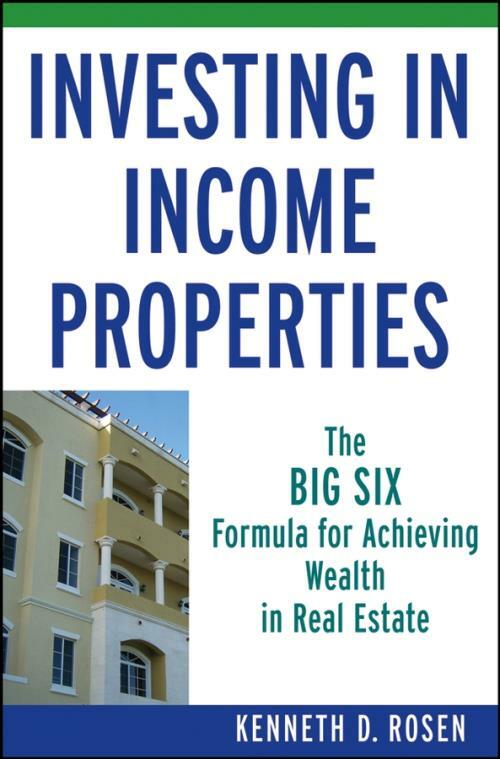 This book should be required reading in all real estate investment courses." "Ken Rosen has a unique ability to make the most complicated seem clear and easy to follow. In Investing in Income Properties, he gives practical steps so that the reader can take action and begin or continue to build wealth by investing in income properties. This book will become the buyer′s bible." "Investing in Income Properties is a step–by–step approach to investing in commercial real estate. It is clear, easy reading with every base covered. This book is a great tool for both the new and seasoned investor." "Ken Rosen′s style is straightforward and his formula for building wealth is well grounded in the fundamentals nothing fancy or tricky about it! He even puts the would–be investor at ease by addressing the fear factors of real estate investing. Twenty–one years into my career as a real estate investment sales broker, I have met many successful investors, but Ken Rosen clearly stands out as a savvy, self–made entrepreneurial investor who is generously sharing his wealth of knowledge and insight in this very instructive and easy–to–read book." Specialist, Cushman & Wakefield of Georgia Inc.
"One of the best, precise, and accurate real estate books on the market. A must–read for investors at any stage." Chapter 1. Why Commercial Real Estate? Real Value, Real Ownership, Real Estate. Chapter 2. Real Estate 101. What Real Estate Can Do for You. Chapter 3. Assembling The Team. Chapter 4. Getting the Money. Obtaining a Home Equity Loan. Cash Value of Life Insurance. Present Sacrifice for Future Benefits. Part Two. The Big Six Formula. Chapter 5. Location: Planting Investment Roots. Chapter 6. Building Quality and Design Efficiency: Ensuring the Long–Term Viability of Your Portfolio. Chapter 7. Tenant Profile: The Right Fit. Factor No. 1: Rental Rate and Terms. Factor No. 2: Gross or Net Lease. Factor No. 3: Size of Units. Factor No. 4: Impact of a National Tenant. Factor No. 5: Right of First Refusal. Factor No. 6: Potential Condo Buyers. Factor No. 7: Parking Considerations. Factor No. 8: Undesirable Mix of Tenants. Chapter 8. Upside: Maximizing the Return on Your Holdings. Tenants Can Set the Price of a Building. Chapter 9. Financing: Choosing the Fiscal Formula that Matches Your Goals. Before You Begin: Your Credit Report. The Advantages of Dealing with Local Banks. Chapter 10. Price: Looking Beyond the Price Tag to See the Big Picture. Chapter 11. Anatomy of a Big Six Deal. Chapter 12. Management and Leasing to Enhance Your Investment. Chapter 13. Condo Conversions: Big Money in Small Apartment Buildings. My Start in Condo Conversions. Criteria for Converting Small Buildings. Bradford Terrace: A Mini Case Study. Chapter 14. One Good Investment is Worth a Lifetime of Labor. The Shift: by Jeffrey Cohen. I Came to New York: by Christine Marie. Love at First Sight: by Tony DeRosa. If I Never Made Another Deal: by Cliff Suchman. You Can Never Know Too Much: by Anthony Dilweg and Andy Roberts. I Made It in Buying: by Kenneth D. Rosen. Kenneth D. Rosen is the founder and President of Kendar Realty, Inc., and one of the pioneers of condo conversions. Over the past thirty years, Rosen has bought and sold $300 million in investment real estate, including apartment complexes, office buildings, retail centers, small–bay warehouses, and large acreage tracts. He is past president of the Realtor Association of Greater Miami and recipient of numerous awards, including Miami Realtor of the Year.